More than two decades after Nandamuri Taraka Rama Rao died, the actor-turned politician, popularly known as NTR, still casts a large shadow over Andhra Pradesh. Months ahead of the 2019 Lok Sabha elections, Andhra Pradesh chief minister N. Chandrababu Naidu has ordered the construction of a 60-foot-tall statue of N.T. Rama Rao in the state’s new capital Amaravati, while two movies on Rao’s life have been slated for release in January. The effort is to participate in the legend of Rao to win some reflected glory. And this isn’t without reason. Apart from ruling the Hyderabad-based Telugu film industry for decades, N.T. Rama Rao was a thrice-appointed chief minister of united Andhra Pradesh. On his 22nd death anniversary, ThePrint takes a look at the life of NTR, who emerged as the only competitor to the Congress in a state that the party ruled for close to three decades. NTR was born on 28 May 1923 to Nandamuri Lakshmaiah and Venkata Ramamma in Nimmakuru village in the Madras presidency of British India. After completing graduation from Andhra Christian College in Guntur, Rao joined the Madras Service Commission as a sub-registrar. But his dreams lay somewhere else. He wanted to act. So he left his job in three weeks. He debuted in the Telugu film industry with Mana Desam in 1949. Two years later, he broke through with Pathala Bharaivi (1951), an enduring classic in the Telugu film history. 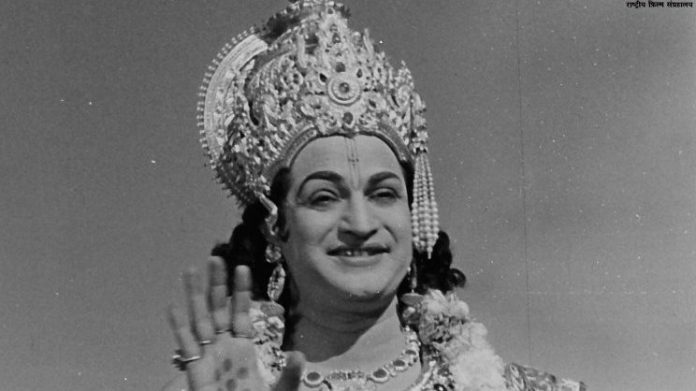 Over his three-decade-long career, NTR prominently worked in mythological films, playing characters from Vishnu to Shiva. Remarkably, he played the role of Krishna in 17 films, a fact that perhaps helped him later in his political career. He played the role of Lord Krishna in Maya Bazaar (1957), Ravana in Bhookailasa (1958), Bhishma in Bhishma (1962), Lord Rama in Lava Kusa (1963), Arjuna in Nartanasala (1963) and the triple role of Krishna, Karna and Duryodhana in Daana Veera Soora Karna (1977). He continued to work in films till 1982 with immense success as an actor and producer. He also acted in over 300 films. He was awarded a Padma Shri for his contribution to Indian cinema in 1968. NTR’s work in films helped him construct a soft image of himself, which served as a springboard when he launched the Telugu Desam Party (TDP). In 1982, he formed the TDP to rid the state of Congress rule and within a year, his party formed the first non-Congress government in the state. Two years later, Rao had to leave for abroad for a coronary bypass surgery. In his absence, Ram Lal, then governor of the state, appointed NTR’s finance minister Nadendla Bhaskara as chief minister of the state. To regain his chair, NTR employed a strategy he had successfully used earlier for election campaigning — ‘Chaitanya Rathan’, a political chariot tour of the state. With a deepening political turmoil, the Indira Gandhi government reluctantly replaced Lal with Shankar Dayal Sharma, who appointed NTR as chief minister. A populist leader, NTR introduced the mid-day meal programme in schools and banned alcohol in the state, among other moves. His measures increased the popularity of his party, but the economy of the state suffered. After Indira Gandhi’s assassination in 1984, the Congress swept the 1985 Lok Sabha elections across the country with 404 seats. But its sweep didn’t make a dent in Andhra Pradesh, where the TDP scored 30 seats, emerging as the second largest party. In the same year, NTR called for the dissolution of the state assembly and returned to power for a second term after the elections. However, after a full successful term, NTR lost to the Congress in an anti-incumbency wave. He returned to power in 1994 in alliance with the Left parties, but was dislodged in a coup led by his son-in-law N. Chandrababu Naidu over familial dispute that stemmed from fears that Rao’s second wife was set to take over the party. Of the three terms he won as chief minister, NTR could successfully complete only one. In 1996, after a long career in public life, NTR died of cardiac arrest. His second wife and biographer, Lakshmi Parvathi, decided not to immerse Rao’s ashes until Naidu was defeated. In 2004, when Naidu was defeated in assembly elections, she performed the last rites of NTR in Srirangapatna.